If there’s one activity most Malaysians enjoy, it’s shopping. Whether it is clothes, car accessories, or even random toys for pets, shopping is a luxury most can’t resist. But one thing Malaysians love more than the activity itself is the great deals that come out in seasons. For its third year running, Malaysia’s biggest online sale event is making its return once more and it’s going to be even bigger and better than before. #MYCYBERSALE 2016 will be running from 26th September till 30th September and the website will go live with the deals at 12am on Monday. For 5 days, Malaysians can expect irresistible promotions from a wide array of merchants that we already know and love. So what do the organisers of #MYCYBERSALE have in store for us this time? 1. There are deals of up to 90% that’s being offered. It’s no secret that big discounts attract customers. During #MYCYBERSALE, shoppers can expect significant deals on products and services from participating eTailers that aren’t so easily found any other time of the year. Also, aside from the massive drop in price, there will also be the additional deal of free shipping, which is always a plus for every shopaholic out there. 2. This year has the highest number of eTailers recorded. Previously in 2014, there were a total number of 200 eTailers participating in the #MYCYBERSALE event and 2015 saw an increase with over 300 eTailers participating for that year. 2016 records the highest number so far with 600 eTailers already approved to be on board! That brings about a total of 10,000 merchants ready to put up their promotions for you to enjoy. This year also sees the highest number of Malaysian brands participating, with 120 local brands ready to cater to the shopper needs. MDEC has also managed to get 55 initiative partners that will help provide a seamless procedure for shoppers to simply click on the site and be able to make their purchase smoothly. 3. For the first time ever, huge brands are jumping on the bandwagon. This year takes a huge step forward with the debut of a few huge companies that most of us are familiar with. For example, four big airlines in Malaysia will be participating for the first time: MAS, AirAsia, Firefly and Malindo Holidays. Travel enthusiasts can anticipate significant deals on flight tickets and packaged promotions to go along with it. Besides that, pharmaceutical brands such as Guardian, Watsons and Caring will also be making their debut in this year’s sale and even certain malls such as One Utama and Jusco’s eCommerce side will be making a presence as well. The normal big eTailers will be returning as well such as Lazada, Groupon and 11 Street along with major fashion names such as Zalora, Uniqlo and Levis. 4. It’s not just online shopping, there are bonus activities too. It’s tradition for each #MYCYBERSALE to have some form of event going on. The usual one making a return is the lucky draw where shoppers spend a minimum amount of RM50 and are automatically eligible to enter for various prizes offered from merchants. So the more you buy, the higher your chances are for walking away with a free gift or two. There will also be a LINE only deals offered which shoppers can join by following the #MYCYBERSALE official LINE account. 5. The deals are specially curated for every shopper. Though we as Malaysians share the same enthusiasm for shopping, we don’t necessarily have the affinity for the same type of products to purchase. Everyone has their own preference on what they’d rather spend their money on, which MDEC has taken into consideration. The deals that will be going live in #MYCYBERSALE have been carefully curated into categories for the ease of shoppers who want to just browse through promotions going on within their interests. 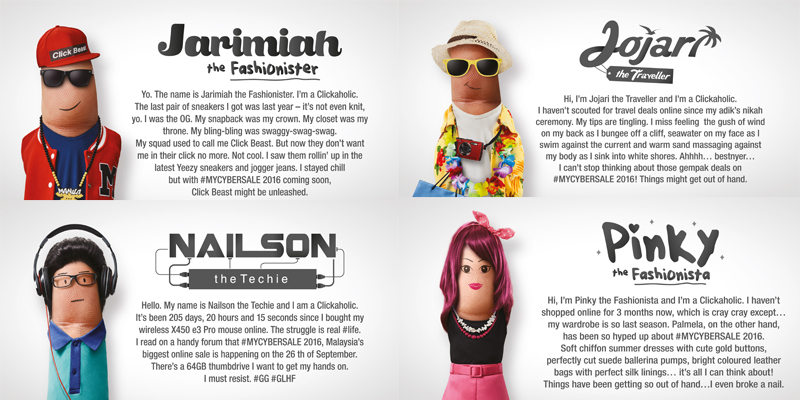 So whether you’re like Pinky the Fashionista who’s only interested in seeing what fashion pieces she can add to her wardrobe or you’re more like Nailson who only wants to see up-to-date gadgets that every techie needs, there are sure to be deals specifically for you to enjoy. Which one do you identify with the most? It’s no denying this will be one of the largest online shopping events in Malaysia. To not miss out on any further information, you can follow the tag #MYCYBERSALE2016 that is used on social media platforms. #MYCYBERSALE is organised by the Malaysia Digital Economy Corporation (MDEC) and supported by the Kementerian Perdagangan Dalam Negeri, Koperasi Dan Kepenggunaan (KPDNKK), CyberSecurityMalaysia and SME Corp. Wanting to help boost the e-commerce industry in Malaysia, MDEC hopes to see #MYCYBERSALE encouraging not only Malaysians to help support homegrown brands more but also to boost the e-commerce industry in our country that continues to grow day by day. So shoppers, get ready to click, slide and tap for great deals as Malaysia’s biggest online sale is about to arrive.